Meet Eva. As Executive Director of Clare House Inc., a shelter for women and their children experiencing homelessness, she is constantly on call. (Literally, always.) Because of the nature of her job, she used to spend a lot of time driving. While she has been riding a bike since the age of 13, she couldn’t envision herself riding the almost 2 miles to work. Recently, Eva decided to prioritize biking. But not just biking, she also decided to learn the mechanics around it too. Eva was determined to learn more about her bike and become a more informed rider, so she enrolled in our Adult Mechanic Class. 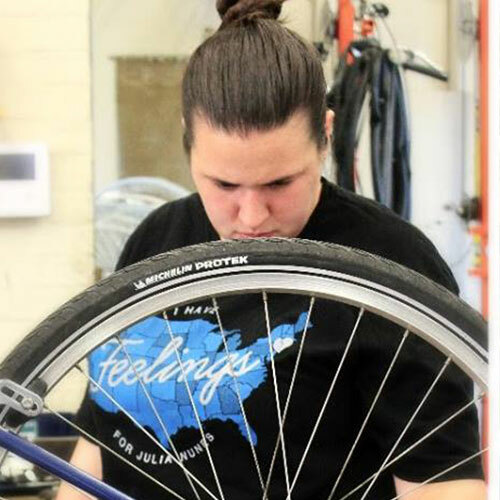 Through this experience, she expanded her bicycle vocabulary, learned to fix and repair her tires, and improved her bicycle diagnostic skills. (And she finally knows how to tell when her brake pads need to be replaced!) Now Eva is well connected to the Lancaster bicycle community and sees the sights and sounds of the city with fresh eyes. Eva is an experiential learner, so she wanted to really know the ins and outs of her bike and generally be more informed about her riding. “You don’t know what you don’t know,” and she’s right. Most of the time, it’s not until we are in jam that we realize that we really don’t know something as well as we think. While Eva had no specific expectations for the class, she hoped that the course would ultimately get her biking more and help her be more safe on the road. Learning more about her bike gave her the confidence and freedom to make biking an everyday part of her life.